Kona– too strong or bitter? First of all, I would be interested to know what “Kona” you bought? Old beans are junk beans.They are bitter because the oils are not stable and tend to decompose. Over roasting can ruin beans. They will taste close to charcoal. A 10% Kona Blend is junk too. You can’t taste 10% Kona in a bag where the other 90% are unidentifiedwhoknowswhat beans and probably cheap and bitter to begin with. There are so many things called Kona Coffee. Many are rip-offs. Good Kona is 100% Kona and fresh roasted. 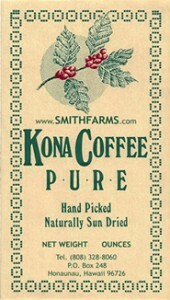 Kona is considered a mild and highly aromatic coffee. We roast our beans to a medium-dark, not burnt- also known as “just before 2nd crack”. Chocolately and yummy.